A flyway is a flight path used in bird migration. Our new men's shirt features mallards landing in the Hi Yall! Flyway. 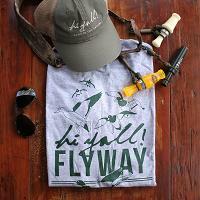 Perfect shirt for your Southern outdoorsman!